Charges of plagiarism are quite common among critics of Christianity. Christians may hear claims that their faith rests on a religion entirely borrowed from older faiths and mythologies. Often described as a relative late-comer to the religious scene, Christianity is alleged to have borrowed from a wide array of mythological traditions. Upon closer examination of the facts, claims of this nature are often baseless and sometimes even fraudulent. Although the description of similarities between the two persons sounds as if some connection exists, problems quickly begin to mount once readers consult the original texts. How well do these alleged parallels stand under closer scrutiny? Very poorly. Let us consider some of the most common claims found in sources from published books and articles to information on the Internet. “Krishna was born of a virgin.” This is a popular claim, sometimes made by atheists,3 but also by those who profess to be Christian.4 Hindu texts make it clear that his mother Devaki had already conceived seven other sons, the first six of whom were executed by the evil prince Kamsa after their births.5 Matthew states that the chaste Mary fulfills an ancient prediction of the prophet Isaiah (Matthew 1:23; cf. Isaiah 7:14). 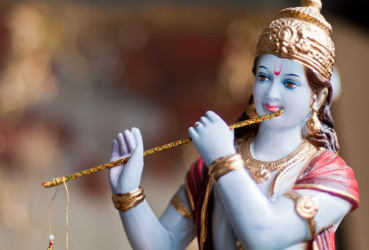 “Krishna was born on December 25, like Jesus.” Sources differ on the exact day of Krishna’s birth, which is often recognized as having occurred in the month of July. Hindus celebrate the birth of Krishna in the month of Bhadrapada (August/September). The Bible does not give a date for the birth of Jesus, which does not appear to have occurred at any time during the winter. Historian Andrew McGowan points out that the second-century author Clement of Alexandria identified several possible dates for the birth of Christ debated during his day, but December 25 is nowhere among his suggestions.7 None of the earliest estimates indicates Christ was born in December. “Krishna died by crucifixion.” Crucifixion appears nowhere in the Hindu texts. Krishna died after a hunter named Jara shot him in the sole of his foot with a poisoned arrow after mistaking him for a deer.9 Kersey Graves infamously claimed Krishna was crucified between two thieves, that darkness attended the event, and that he gives up the ghost and descends into hell,10 details he—or a source he used—invented out of whole cloth. “Krishna resurrected after three days.” After his death, Krishna’s spirit appears almost immediately.11 Being liberated from his physical body—or abandoning it—his spirit returns to the realm of the divine. Hindu pilgrims today still visit Dehotsarga (literally, where Krishna “gave up his body”),12 where they believe Krishna died. Jesus was buried in a newly cut rock tomb and later experienced a bodily resurrection that serves as a prototype for believers (1 Corinthians 15:20, 42-44). The Hindu view of Krishna’s death is much closer to Neo-Platonic philosophy than it is to Christianity. A common problem found in the work of militant critics is the failure to adequately understand the beliefs of the religions they oppose. Critics can be inexcusably careless in their descriptions, making ancient religions appear more similar than they really are. This is often done by describing non-Christian elements of other religions using Christian vocabulary, and then marveling at the similarities between the two. In some cases (especially authors from the 19th and early 20th centuries), these parallels were made using vague interpretations, supported by evidence which was poorly understood and likely fabricated. Despite claims to the contrary, the story of Christ in no way plagiarizes the story of Krishna. To argue otherwise is to twist and distort the teachings of both Christianity and Hinduism. 1 See Dorothy Murdock (2004), Suns of God: Krishna, Buddha and Christ Unveiled (Kempton, IL: Adventures Unlimited Press), pp. 160-165. 2 Vaman Shivaram Apte (1957-1959), The Practical Sanskrit-English Dictionary, http://dsalsrv02.uchicago.edu/cgi-bin/philologic/getobject.pl?c.2:1:1423.apte. 3 Christopher Hitchens (2007), God is Not Great: How Religion Poisons Everything (New York: Twelve), p. 23. 4 See John Shelby Spong (1992), Born of a Woman: A Bishop Rethinks the Virgin Birth and Treatment of Women by a Male-Dominated Church (San Francisco, CA: Harper), p. 56. 7 Andrew McGowan (2002), “How December 25 Became Christmas,” Bible Review, 18, http://www.biblicalarchaeology.org/daily/biblical-topics/new-testament/how-december-25-became-christmas/. 8 “Lord Krishna Lived for 125 Years” (2004), Times of India, http://timesofindia.indiatimes.com/india/Lord-Krishna-lived-for-125-years/articleshow/844211.cms. 9 Mahabharata, 16:4; Vishnu Purana, 5.37. 10 Kersey Graves (1976), The World’s Sixteen Crucified Saviors; or, Christianity Before Christ (Boston, MA: Colby and Rich), pp. 229-230. 12 Diana Eck (2012), India: A Sacred Geography (New York: Harmony Books), p. 381. 13 Mike Licona (2001), “A Refutation of Acharya S’s book, The Christ Conspiracy,” http://www.risenjesus.com/a-refutation-of-acharya-ss-book-the-christ-conspiracy.